BSSC Inter Level Admit Card 2017 – Download Bihar SSC Inter Level Re-Exam Call letter: Are you looking for BSSC Inter Level Prelim Exam Admit Card (2014-15-16-17)? When BSSC Inter Level Exam Admit card will be out? One of the most frequently asked question candidates have in their mind who had applied for Bihar SSC Inter Level Exam (Advt. 06060114) long ago in 2014. Since then, Candidates are waiting for download Admit Cards for BSSC Inter Level Revenue Clerk and Panchayat Secretary posts. Update: Bihar SSC Inter Level Re-Exam to be held in November 2017. Finally good news for fellow BSSC applicants. Bihar SSC Inter level Preliminary exam has been scheduled. As per the BSSC Inter Level Exam Date, it will be held in November 2017. Follow the link below to download BSSC Admit Card. Bihar Staff Selection Commission (BSSC) is finally decided to issue Bihar Inter level exam admit card. They are now all set to conduct Inter Level Combined Competitive examination. BSSC is going to held written examination for various Panchayat Secretary and Revenue Clerk posts in Bihar state. The Preliminary Admit Cards for BSSC Inter level has scheduled to be held in 4 Stage. Aspirants can download the Bihar SSC PT Admit Cards for Inter Level exams 2016-17. One and half year has been passed since BSSC issued notification for BSSC Inter Level Exam in 2014. A large number of candidates have applied for Bihar SSC Inter Level in September/ October 2014. All those aspirants who had applied for BSSC Inter Level posts are now waiting for Bihar SSC preliminary written examination call letter. BSSC Inter Level Exam Syllabus. BSSC Inter Level written exam is going to be held in November, December 2017 (Sunday) after three year of Notification. All those candidates who are going to appear for Bihar SSC exam must download their admit card. When Admit Card of Bihar SSC Inter Level exam will be out? According to the sources from Bihar Staff Selection Commission (BSSC), Bihar SSC Inter Level Written Exam to be held from in November 2017. BSSC Inter Level Written Examination (PT): November 2017. Downloading Admit Card: October 2017. BSSC Inter Level Admit Card [Available Shortly]. Due to the Bihar State Assembly Elections and other various reason this year, BSSC Inter Level Examination has been delayed. Now they are preparing for conduction of Bihar SSC Inter level exams once again. BSSC Inter Level exam is tentatively scheduled to be held in November and December of this year. Here is how to download Bihar SSC Inter Level P.T. Exam Admit card. Now click on "Download Admit card for 1st Inter Level Competitive Exam". Enter required details i.e. Registration No. and Date of Birth. Candidates are strongly advised not to wait for keep visiting this page on regular basic until they download their BSSC Inter level admit card. We will update this page and bring you Bihar SSC Inter level exam call letter right here on this page. 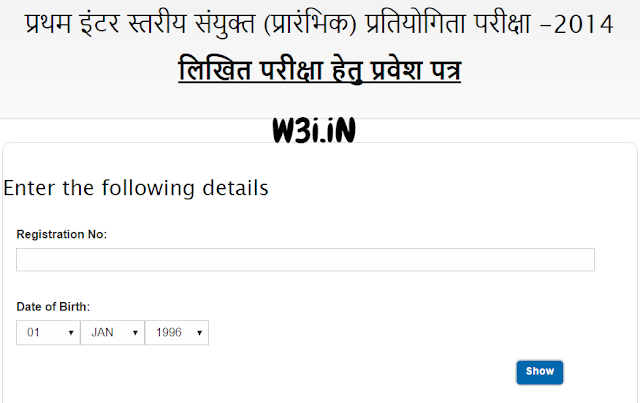 Follow the link given below to download Bihar SSC Inter level exam Admit card.